These days, I’m using fewer external libraries. First, I don’t like most Swift libraries out there, they’re often implemented in a complicated way and contain too many protocols for my taste. Second, I’m not sure how they’ll be maintained in the future, and most libraries are pretty big – I don’t really want to own that code. Third, I’m too lazy to set up a dependency manager, so I’ll keep my projects dependency-free. It’s always the same pattern: adding the subview, setting translatesAutoresizingMaskIntoConstraints to false, and then activating the constraints. The first anchor and the second anchor are almost always the same, and on the left-hand side we always have the child and on the right-hand side we always have the parent view. Often, when I write the code above, I forget to active the constraints or forget to set translatesAutoresizingMaskIntoConstraints. Let’s try to solve as many of these problems as we can in as little code as possible. Note that constraint is just a description of a layout constraint – it’s still waiting for a concrete child and parent view. It says that, given a child and parent, the child’s top anchor should be equal to the parent’s safeAreaLayoutGuide.topAnchor. Finally, let’s solve the last two problems: we don’t want to forget to set translatesAutoresizingMaskIntoConstraints to false, and we don’t want to forget to activate the constraints. What if we create another version of addSubview that does this for us? The code is shorter and much more to the point. The translatesAutoresizingMaskIntoConstraints is set automatically, and all constraints are activated. Instead of depending on a big library, we wrote three methods; 15 lines of code in total. Obviously, there are many things you can’t do with this: for example, you can’t easily keep a reference to a specific constraint and change the constant property. That’s fine, we can keep using the regular Auto Layout API for this. Thanks to Florian Kugler for helping me simplify the code a lot. We also made a Swift Talk episode about the code above, check it out. 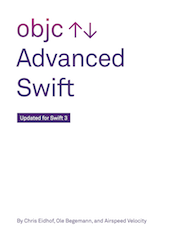 If you liked this article, check out our book Advanced Swift (updated for Swift 4), or check out our video series Swift Talk.